to the beach - 0.25 km. 4-bedroom apartment near the beach with sea view for rent in Yuzhny ( Yuzhnoe, Yuzhne), Odessa region. Address: Yuzhny, 19 Primorskaja Str. 3-bedroom apartment near the beach with sea view for rent in Yuzhny ( Yuzhnoe, Yuzhne), Odessa region. to the beach - 0.83 km. to the beach - 0.40 km. 3 Stroitelej Str., (corner of 19 Primorskaja Str.). Sea view from all windows of the apartment. 2-bedroom VIP apartment in Yuzhny. Seaview. Address: Yuzhny, 3 Stroitelej Str., (corner of 19 Primorskaja Str.). Sea view from all windows of the apartment. to the beach - 0.80 km. Apartments for rent in Yuzhny. 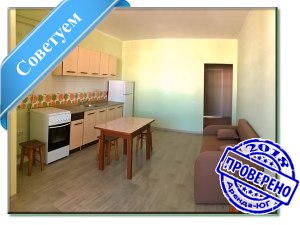 Rent an apartment in Yuzhny. Apartment for rent in Yuzhny. Yuzhny - is the pearl of the south of Ukraine. Anyone who has ever been in this corner of paradise in the south of Ukraine, always with a warm remembers this lovely place. Yuzhny (Yuzhnoe or Yuzhne) - a young modern town in the Odessa area with developed infrastructure. Yuzhny - a spacious beach, an oasis of calm, clean and beautiful: great beds, lovely Palace of Sports "Olympus". Yuzhny is very popular among people who love to spend the summer on the sea in a comfortable environment and do not overpay for it. Our site will help you choose an apartment for daily rent in Yuzhny, to suit your needs. Apartment for rent in Yuzhny - this is our profile. We will help you select and book an apartment in Yuzhny. We provide the most information about renting an apartment in Yuzhny. You can choose and book an apartment in Yuzhny. Rent an apartment in Yuzhny - a cheap and comfortable way to stay in the Black Sea.